In 2013, 163.4 million workers had earnings taxable under the Social Security program. About 144.7 million had only wages, 11.0 million had only self-employment income, and 7.6 million had both. Social Security taxable earnings totaled $5.937 trillion, which includes earnings up to the taxable maximum of $113,700. Social Security taxes totaled about $736 billion. In 2013, 167.3 million workers had earnings taxable under the Medicare program. About 147.8 million had only wages, 10.7 million had only self-employment income, and 8.7 million had both. Medicare taxable earnings totaled $7.356 trillion. Medicare taxes totaled about $213 billion. 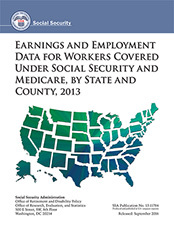 This report presents 2013 earnings and employment data by state and county for persons covered under the Social Security and Medicare programs.